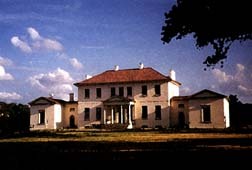 The Riversdale Historical Society is devoted to the preservation and restoration of Riversdale, a plantation home built between 1801 and 1807 by the Stier and Calvert families. This National Historical Landmark is located at 4811 Riverdale Road, in the heart of Riverdale Park. Society members also act as docents for Riversdale, giving visitors a chance to learn about plantation life in the early 1800s. Call (301) 864-0420, for more information. When 1st Wendnesday of EVERY OTHER month, September through May 7:30 p.m. This page was last changed on Monday, April 17, 2006. Questions, comments, or submissions? See the Website Committee web page. This page has been accessed 36765 times.